Kagan Pittman for Engineering.com: Lights-out manufacturing is the ultimate achievement of advanced automation and industrial robotics is the key. HIROTEC AMERICA, a provider of weld assembly equipment for OEMs, is chasing that dream on the back of a robot that, frankly, looks like a sci-fi centaur. 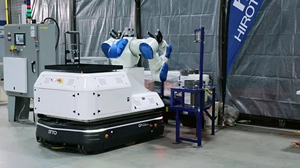 Combining an OTTO 1500 self-driving vehicle with a pair of Yaskawa Motoman robotic arms, HIROTEC has begun an initiative to completely automate its facility by 2025, relegating its human workforce to higher-value positions requiring complex problem solving and attention to detail. The robot combo has been tasked with automating a black oxide process, which involves dipping parts in various chemical baths in a precise sequence. Specific time delays are required between dips as parts become oxidized, resulting in a corrosion-resistant surface.